Welcome to horse-diseases.com. This website gives information on common horse diseases, especially on the horse's foot. Conditions like common horse hoof diseases or acute laminitus in horses are briefly explained, but you also wil find some useful information like the anatomy of a horse hoof. The importance of diseases of the horse's foot can hardly be overestimated. That the animal's usefulness is dependent upon his possession of four good feet is a fact that has long been recognised. Who, indeed, is there to be found entirely unacquainted with one or other of such well-known aphorisms as: 'Whoever hath charge of a horse's foot has the care of his whole body'; 'As well a horse with no head as a horse with no foot'; or the perhaps better known, and certainly more epigrammatic, 'No foot, no horse'. The material presented in this website is provided for educational and informational purposes only. Decisions regarding the health and welfare of your horse should be made only after consultation with a veterinarian with whom a valid client-patient-veterinarian relationship has been established. 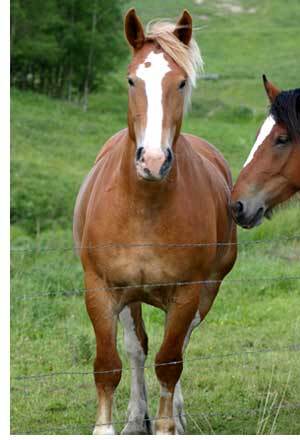 Contact your professional horse veterinary for a diagnose and treatment of a horse disease.